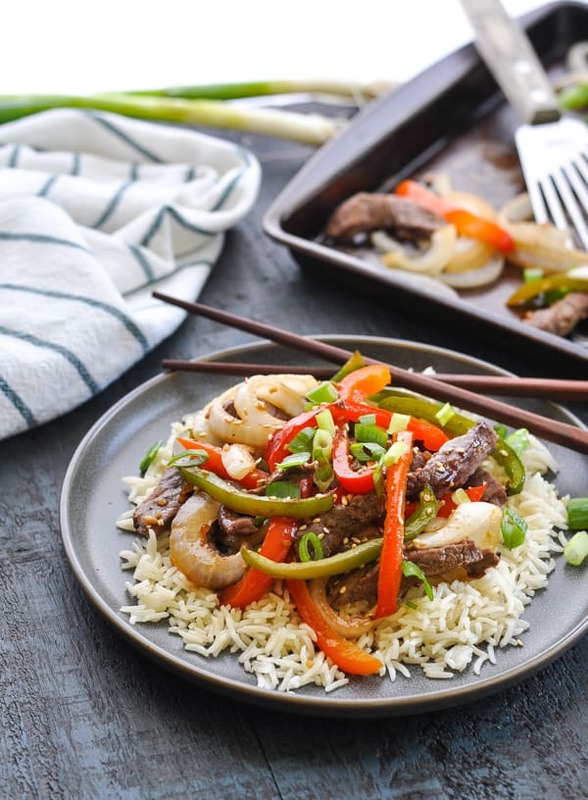 ​​​​​​​This Dump-and-Bake Chinese Pepper Steak is an easy and healthy sheet pan dinner recipe that comes together with just 10 minutes of prep! 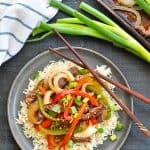 This Dump-and-Bake Chinese Pepper Steak is an easy and healthy sheet pan dinner recipe that comes together with just 10 minutes of prep! It’s lighter, tastier, and faster than your favorite restaurant takeout. Don’t you just love a hands-off meal that doesn’t require stirring, hovering, boiling, or frying? 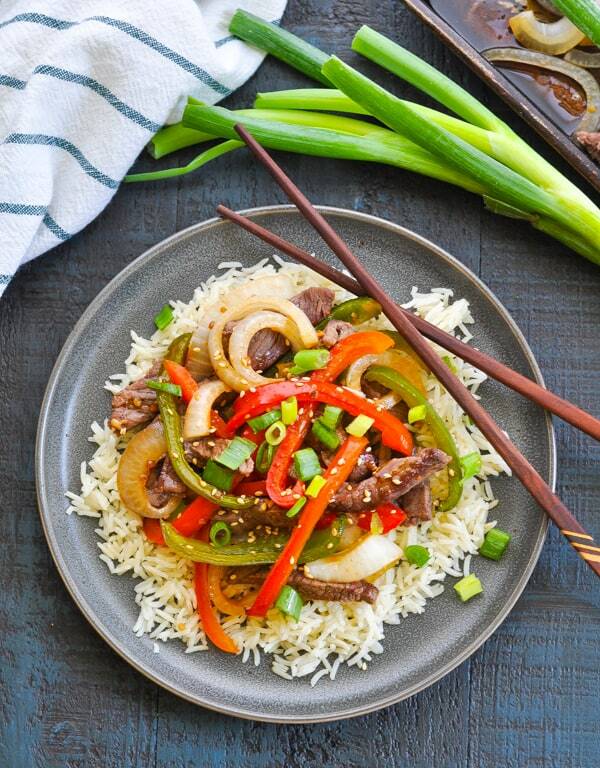 This simple dump-and-bake version of Chinese Pepper Steak gives you all of the flavor that you love, without any of the time-consuming effort! 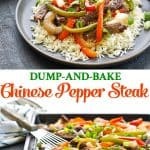 Between my Dump-and-Bake General Tso Chicken, my Dump-and-Bake Kung Pao Chicken, my Dump-and-Bake Sweet and Sour Chicken, and now my Dump-and-Bake Chinese Pepper Steak, I feel like I’ve been on a real dump-and-bake Chinese food kick. I just love how the simple flavors come together easily to transform a few healthy ingredients into a delicious and satisfying meal. 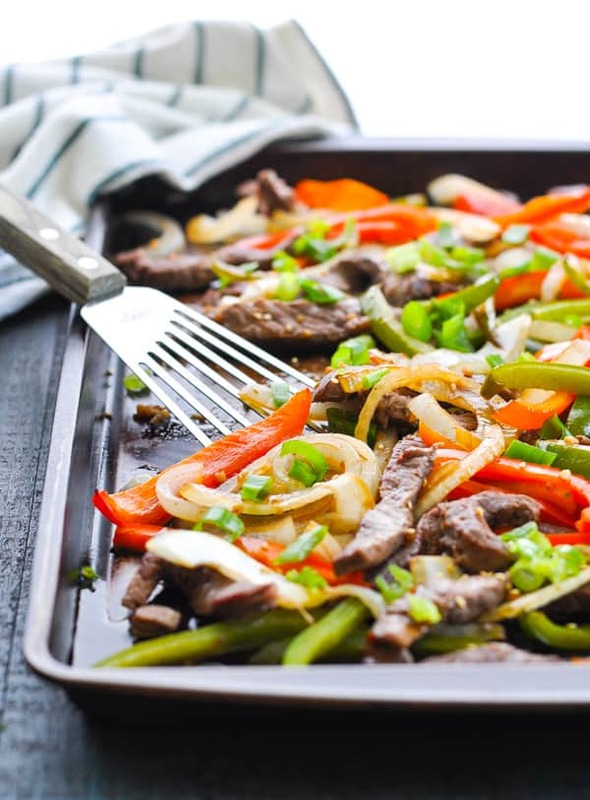 In this recipe, I’ve used plenty of lean protein, fresh bell peppers, and sweet sliced onion to create a nourishing and satisfying dinner that bakes on ONE TRAY in about 15 minutes. How awesome is that?! 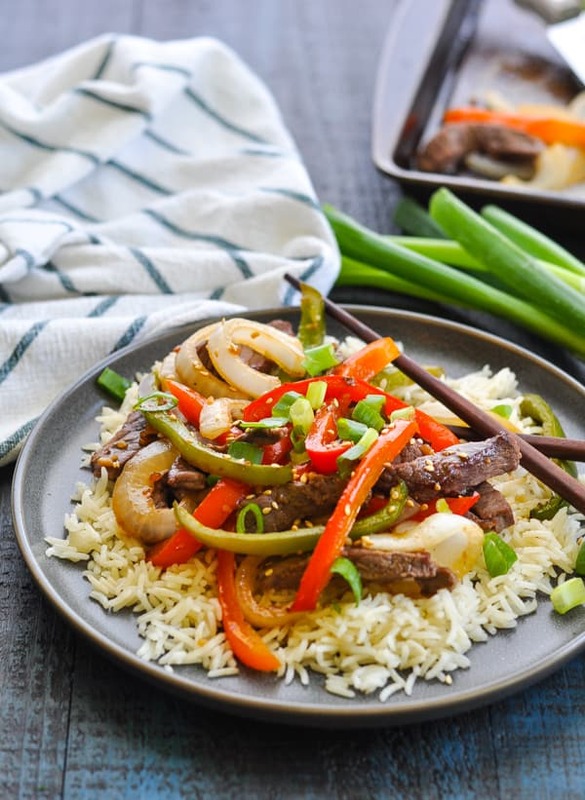 It’s so perfect for a last-minute meal on a busy night. 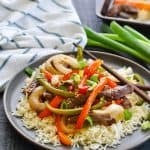 How do you make pepper steak and rice? First, you’ll start by whisking together soy sauce, brown sugar, garlic, ginger and pepper. Nothing fancy and no weird ingredients! 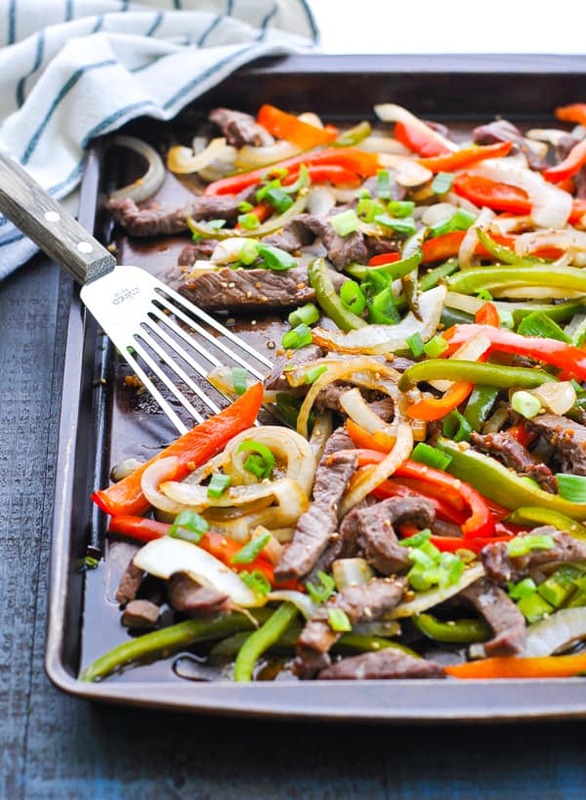 Then line a large rimmed baking sheet with foil, spray with cooking spray, and spread the sliced bell peppers, onion, and boneless beef sirloin steak in a single layer on the prepared pan. 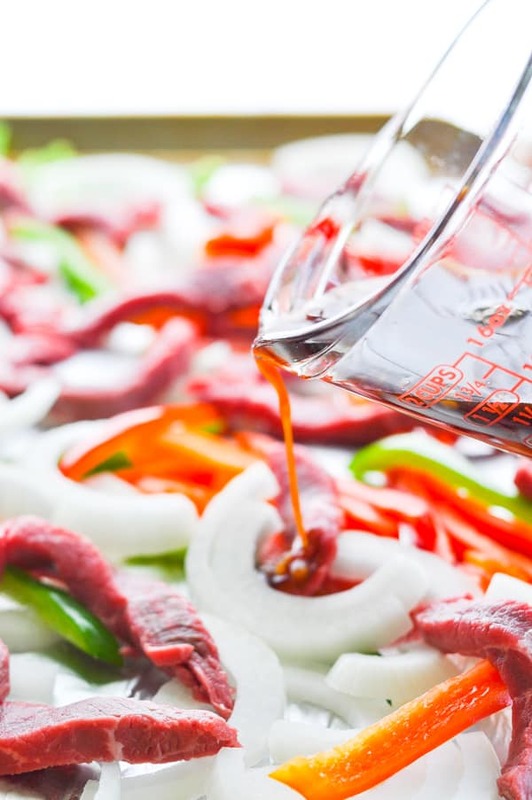 Pour half of the sauce over the beef and vegetables, and toss to coat. Reserve the other half of the sauce for later. The pan goes into a 450 degree F oven for about 10-14 minutes (or until the beef is cooked to your liking). A little garnish of sliced green onion and sesame seeds finish off the dish! Make your own cauliflower rice or microwave a bag of frozen cauliflower rice for a quick grain-free option! 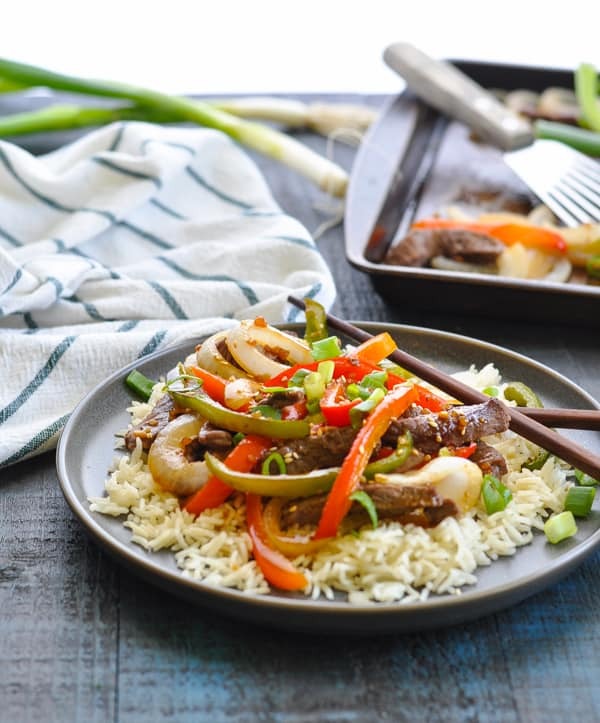 If you’ve tried this Dump-and-Bake Chinese Pepper Steak or any other recipe on The Seasoned Mom, then don’t forget to rate the recipe and leave me a comment below! You can follow me on Facebook, on Instagram, on Pinterest, and on Twitter! Preheat oven to 450 degrees F. Spray a large, rimmed baking sheet with cooking spray (if desired, line with foil first for easy cleanup). Set aside. 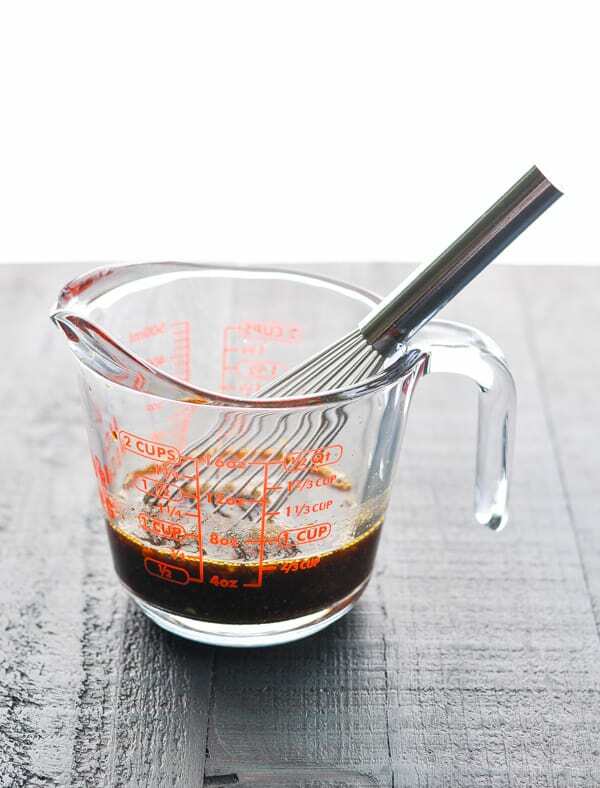 In a small bowl, whisk together soy sauce, garlic, brown sugar, ginger, and pepper. Set aside. 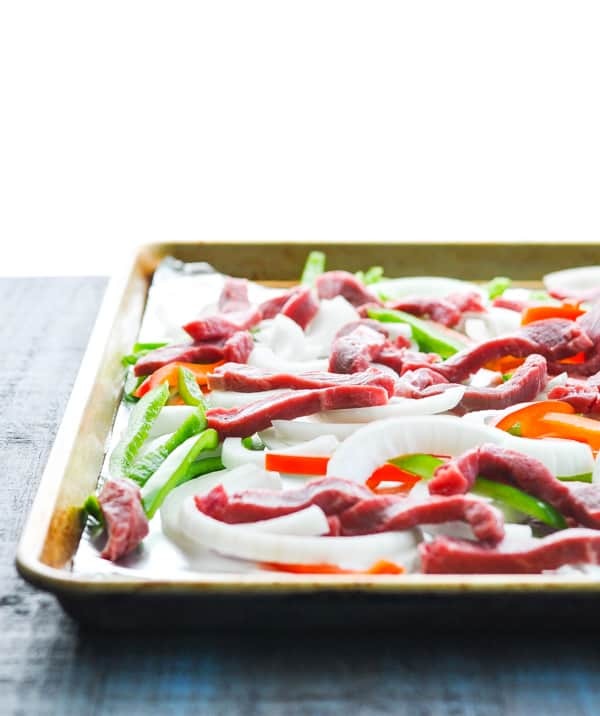 Place beef, bell peppers, and onion in a single layer on the prepared baking sheet. Pour half of the sauce (about 1/3 cup) over top and toss to coat. Roast beef and vegetables for 10-14 minutes, or until beef is cooked to desired doneness (about 145 degrees F for medium-rare). Toss with reserved sauce. Garnish with sesame seeds and sliced green onions. Serve over rice, if desired. Cooking Just for Two? Cut the ingredients in half. The rest of the instructions remain the same. In the directions it says mix in honey ,but no honey is listed in the ingredients. How mMaryuch honey? OH! Thank you for catching that typo, Mary! After testing the recipe a couple of times, I decided to swap out the honey for brown sugar, so you don’t need the honey at all. I’ll fix that in the instructions! Thanks again for noticing! Awesome recipe. ..thanks so much for this last minute meal.love it..